Judy Woodruff: If you followed any number of stories about asbestos and its role with cancer, deaths and health problems over the years, you might think it’s been banned from use in the United States. Well, that’s not the case. It is true that asbestos is not used in building materials the way it once was. But it still is found in some household products, and some public health experts worry about its continued use. Miles O’Brien is back with that story, and why the regulation and oversight of it remains a public health concern. It’s for our weekly segment on the Leading Edge of science, technology and health. Miles O’Brien: For 15 years, Linda Reinstein has pounded the marble halls of power in Washington, a foot soldier in a long environmental battle that you might think was over. Linda Reinstein: We deserve to have our air free of contaminants, air, soil and water. And without an asbestos ban on all products, we remain in peril. Miles O’Brien: Asbestos, naturally occurring mineral fibers that are durable, fire-resistant and highly carcinogenic. Breathing them can trigger lethal diseases. There is no debate about that. But more than 50 years after a landmark study confirmed this, asbestos is a poster child for a broken regulatory process. It is still used by U.S. industry, present in 30 million homes, and is a contaminant in consumer products, including children’s toys and makeup. Woman: The FDA is now warning parents to throw out three products from Claire’s after new tests found they contained asbestos. Miles O’Brien: Officially, asbestos kills nearly 3,000 Americans every year, but these deaths are under-reported. Environmental and health advocates believe the actual toll is much higher. Linda Reinstein: I urge you to expeditiously and thoroughly evaluate the risk, and move to fully banning asbestos without any exemptions. Miles O’Brien: In 2006, Linda Reinstein’s husband, Alan, died of mesothelioma, cancer of the thin layer of tissue that covers our internal organs, a fatal disease caused almost exclusively by asbestos. Alan Reinstein was exposed to asbestos at a shipyard and while doing home renovations. His widow is pushing newly introduced legislation to enact an outright ban on asbestos. Do you feel like you have made progress? Linda Reinstein: Progress is glacially slow. I have buried so many people I have known and loved, including my husband. Paul Zygielbaum: Yes. I’m just loopy from the drugs. Miles O’Brien: Paul Zygielbaum is one of those stories behind the grim numbers. When we first met him in December of 2017, he was in the midst of a powerful chemotherapy infusion 14 years after he was diagnosed with mesothelioma. Paul Zygielbaum: I’m just hoping that I can get back to a better physical condition, to where I can do the things I want to do. And I have no idea whether that’s going to happen or not, so that is kind of frustrating. Miles O’Brien: This is just one of more than 50 rounds of chemotherapy and immunotherapy he endured. A former engineer for the space, computer and utility industries, he believes he was exposed to asbestos at a power plant. Paul Zygielbaum: This is a carcinogen. It’s deadly. It’s insidious, because a disease doesn’t show up for 15 to 50 years after exposure. And it’s like there’s a blind eye being turned to that, where that doesn’t happen with many other carcinogens. Miles O’Brien: Why do you think that is? Paul Zygielbaum: I think there’s decades of industry lobbying behind it. Miles O’Brien: But scientists see a lot of need for urgency. Every time they look at asbestos under an electron microscope, they are reminded of the risks. Brenda Buck is a medical geologist at the University of Nevada, Las Vegas. Brenda Buck: This little fiber coming off here is quite long and very thin, which is very typical of asbestos fibers. It’s strong. It’s durable. It’s fireproof. Miles O’Brien: Those properties made them an appealing choice in hundreds of household products. At one time, asbestos was marketed as a modern marvel. Woman: Ooh, it is attractive. Man: Yes, and it’ll stay that way too. That’s what I like about it. Miles O’Brien: But people who worked around it in shipyards factories and mines, started getting sick, most infamously in Libby, Montana, where asbestos dust from a mine has killed 10 percent of the population. Brenda Buck: They have these great properties that we can use in materials, but those very same properties is why they’re so hazardous in the human body. They don’t break down. When you breath them in, they’re pretty much going to stick with you for your lifetime. Miles O’Brien: The human immune system response? Attack the stubborn fiber. But, eventually, this backfires, creating damage, disease and eventually death from cancer and a host of other afflictions. Brenda Buck: So, the government started to regulate occupational exposures. They started at pretty high levels. And as more and more science was conducted, we began to realize that we needed lower and lower exposures to prevent disease. Miles O’Brien: In the 1980s, schools across the country scrambled to remove asbestos insulation from pipes and boilers. Then, in 1989, the EPA issued a ban on the manufacturing, importation, processing and sale of products containing asbestos. But the chemical industry successfully sued to overturn it in 1991. So, in 2016, Congress and the Obama administration enacted an updated Toxic Substances Control Act. The idea? Give the EPA more teeth to regulate asbestos and other hazardous chemicals that remain in the environment. 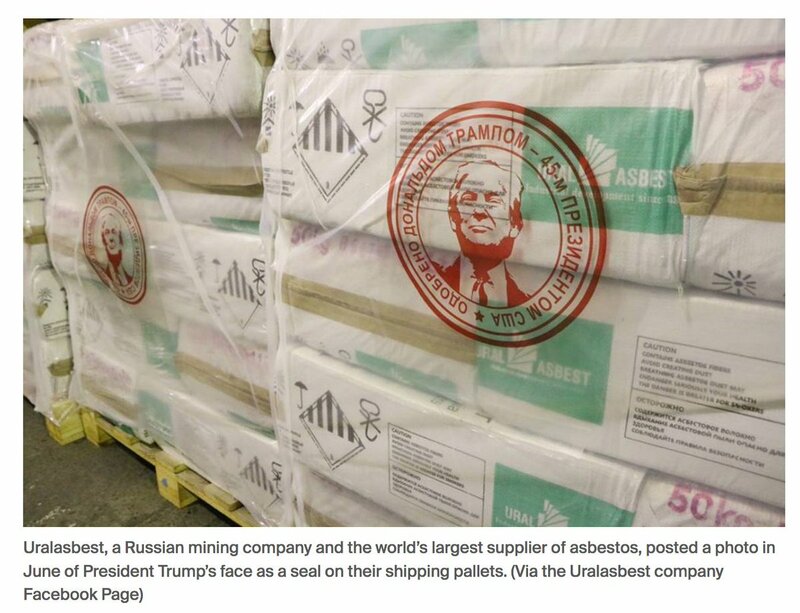 Donald Trump: A lot of people in my industry believe asbestos is the greatest fireproofing material ever — ever made. Miles O’Brien: Trump’s appointee in charge of chemical safety at the EPA is Nancy Beck, who came straight from a high-level post at the largest chemical lobbying firm in the country, the American Chemistry Council. But, under her leadership, the EPA is refusing to even study, much less regulate, the legacy asbestos that is all around us. The EPA says it is committed to protecting the public from asbestos exposures. And it says, the statute gives discretion to the administrator to focus on the uses that are of greatest concern. Linda Reinstein: It’s a David-and-Goliath battle. And we are the small person trying to move big mountains. There’s huge money that flows. Miles O’Brien: And so does the asbestos. The United States has imported more than 6,000 tons of asbestos since 2011, almost all of it used by the chlor-alkali industry to make chlorine. It mostly comes from Brazil, but, in 2017, that country banned the mineral, as have more than 60 other nations. Meanwhile, in Southern Nevada, Brenda Buck and her colleague medical geologist Rodney Metcalf have found even more troubling cause for concern about asbestos. Man: It’s everywhere. Look at this, everywhere. Miles O’Brien: They have mapped more than a million acres of naturally occurring asbestos here. The discovery came after they uncovered evidence of unusually high rates of mesothelioma among women and children, a telltale sign of asbestos exposure that is environmental, rather than occupational. Brenda Buck: Even if the EPA banned all use of asbestos in the nation, we still have it occurring in our soils, and therefore, in our air. And people are still being exposed to it just through these natural mechanisms. Miles O’Brien: The Occupational Safety and Health Administration has set limits on asbestos use in the workplace. But scientists say there is no evidence there is any safe level of exposure to asbestos, which is why Linda Reinstein keeps pushing for a total ban. Linda Reinstein: Alan’s chair will remain empty forever, and my heart will be broken, but I will fight on. Paul Zygielbaum: I’m optimistic about a change in attitude in Washington. I think it can happen. I don’t think we’re done yet. But I think, ultimately, we will win. Miles O’Brien: You’re an unlikely optimist. Paul Zygielbaum: That’s what keeps me going. Miles O’Brien: Paul Zygielbaum lost his 15-year battle with mesothelioma on January 25. Asbestos will likely take thousands of other American lives before the year ends. The deaths are slow and painful, not unlike the regulatory response to this public health crisis. For the “PBS NewsHour,” I’m Miles O’Brien in Santa Rosa, California. The post, The stunning truth about asbestos use in the U.S., first appeared on the PBS NewsHour website.